We call Cluster Beans as Mattikaya in Telugu and Kothavarangai in Tamil. Until I started cooking, I never knew the tamil names for many of the Vegetables. I almost feel strange when trying to recollect what Amma says for each one. Though I never really lived in Andhra, I know them by their Telugu names. My parents have ensured we learn the language and continue speaking only at home. And cluster beans is one of favorites with Andhrites. I got this assured when even Athamma wants to make Mattikayala kura every other day. As Daddy loves this curry, it used to make frequent appearance on our dinner table. Since I had that strange habit of not wanting to make certain vegetables, even though I like when it's made, I ensured I gave this a miss most of the time. But alas! entered Athamma, with a soft corner for this abandoned Vegetable. And this is reigning it's head to shamelessly rule the kitchen world every now and then. But it was a surprise that this has an interesting tale to tell. From goggling, I was enlighten to know that this is used to prepare a guar gum, which is used as a thickener and emulsifier in commercial food processing. Facts never fail to amaze us. 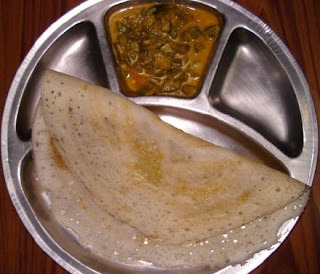 Well if I am forced to eat this, then let me eat with something I love - Dosa! This tastes excellent with Dosa. 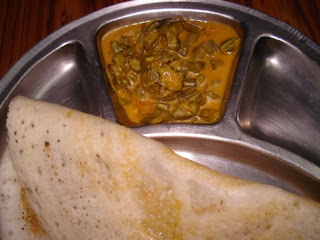 Amma always goes for Vegetable curries for Dosas, which I have also imbibed. That's my daughter's plate, she was happy that I was taking a photo of her breakfast plate.